The civil war in Syria rages not only on the ground but also on internet. The opposition has made increasing use of platforms such as Facebook to organize and spread their message. In response the regime have tried to disrupt these activities by defacing websites and spamming Facebook pages. The regime is using the DarkComet RAT (called Backdoor:Win32/Fynloski.A by Microsoft) to spy on their own people.The creator of the DarkComet RAT was disgusted by that behaviour and now has retaliated with a specially created tool to detect and remove his own DarkComet RAT to help the oppressed Syrian people, DarkComet RAT Remover. 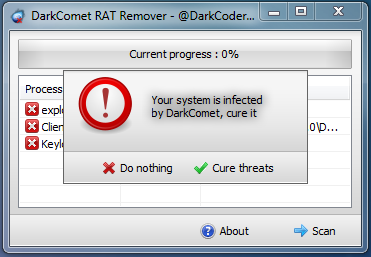 DarkComet RAT Remover will detect any kind of instance of darkcomet running in memory even if an hacker try to obfuscate the loader to be undetected by common Antivirus softwares, also it detects registry threats and keyloggers logs. [+] Detect DarkComet Even if crypted. [+] Detect DarkComet Even if visualized. [+] Detect DarkComet Even if injected in a remote process. [+] Detect DarkComet Even if Protected / Packed. [+] Detect Registry Changes by DarkComet.